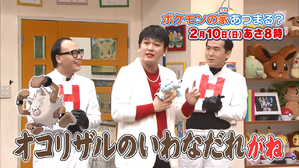 » Episode Guide » Viewing Episode: トレンディエンジェルによるハゲット団がボスを連れてきた！？ / ピカブイGO！ゲームで対決 / あばれる君から重大発表！/The Baldket Gang, Played by Trendy Angel, Show Up with their Boss in Tow?! / A Showdown in the Pika-Vui-Go! Game / An Important Announcement from Abareru-kun!